Finally managed to drag Donna from the Grey Ridge Vineyard and head off in the direction of the Central Otago Rail Trail. We planned to go to the Omakau Commercial Hotel but as this was only 15 minutes down the road we pushed on to the Saint Bathans gold field and community. We arrived late in the afternoon and had a look at the “town” and thought we would head to the Doc camping site at the Saint Bathans Domain. On entering the Domain we found that the local farmer was grazing his ewes. Oh well the camp is advertised as pet friendly but with the killer ewes on the loose Mac and Rose would have a very subdued time. We cautiously drove around the domain looking for a suitable site to park up. The metal track was dug up in places by the farmers vehicles so we decided to retreat to the safer ground near the entrance. As sure as bears sh_t in the woods we get into some soft ground and get stuck. Out came the shovel and we filled the bucket up with gravel from around the track and and managed to extricate ourselves and left the domain and headed back to Omakau Commercial Hotel. 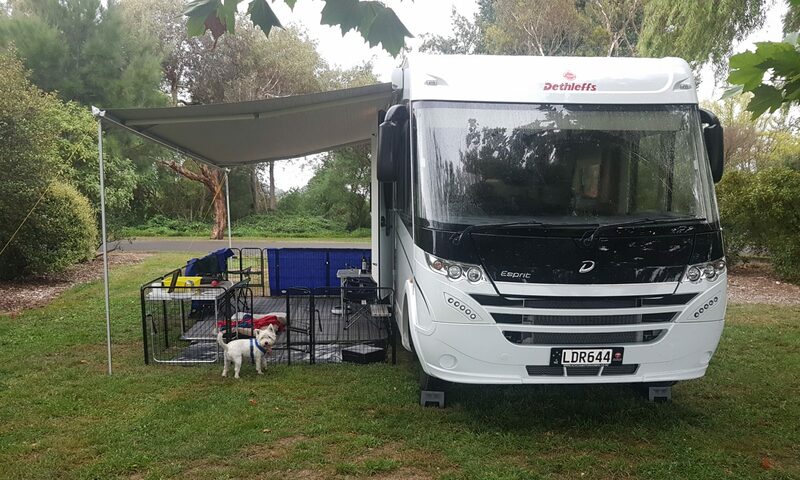 We were treated to the perfect Motor Home park with power on concrete platform away from the road noise. The hotel was well presented and served a mean dinner. There goes the diet again very short lived as it only began since leaving the vineyard. Decided that morning dog walk would be best serve by experiencing the rail trail and had a great hour walk along the trail. We then headed back to Staint Bathans to to take in the trail around the gold diggings to find the the trail had been closed due to slips. Well signposted NOT as you had to go to the trail to see the sign where one would have thought the place to put the sign was at the car park where the map of the trails were displayed. We wandered around the diggings that were still open to the public and got to see the diggings and the scars left on the landscape from the mining. We wandered up the old main street and saw the old building some like the church and the hotel still in use today. Pub lunch was on the cards (diet was buggered anyway) and was very different and it appeared the the barmaid had been there since the diggings were still in operation 70 years ago. We had such a good stay at the Omakau Commercial Hotel we had to go back for the night and had a nice quiet evening. Next morning down the rail trail in the opposite direction and Mac and Rose made the most of it by spooking a hare and giving chase down the trail until they lost sight of the retreating prey. On the road again to Naseby via the Ida Flats which are very dry and require high levels of irrigation. Naseby was a disappointment and looked very run down and considering the winter was the high season one has to wonder how long the town will last. Onward to Ranfurly and the NZMCA park and what a surprise to see what was parked there. The Motor Home is 10 years old and built by the owner. He and his wife live in it permanently working through out the South Island installing windows etc. We will stay today and leave Saturday for Mosgiel/Dunedin. We are impressed with Ranfurly and look forward to exploring what there is of it for the rest of today.